Well, it took me a few days to find some time to write again, but here I am. Yesterday I had the day off, but as always it was filled with lots of things. 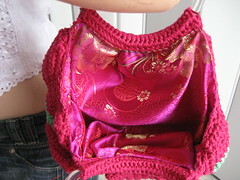 In the morning I finished lining a couple of fat bottom bags - what a fun bag to make, I really enjoyed it! Later on I did some yard work - man, my yard needs work desperately! There are sticker bushes growing all over the place, oh well, little by little I will get done. In the afternoon I went to visit my husband's grandma and at night I went to a little coffee shop to meet up with a couple of friends, which was very nice, then came home made a yummy healthy dinner (me and my husband are trying to lose some weight) and ended the day watching TV with my hubby while doing crochet.